Have you ever wondered where the names of devices come from? Some companies select themes around which to build a family whether that be music, space or simple numbers. At Stowood the selection of product names is a little more personal. 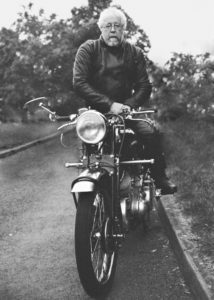 The founder of Stowood, Lyn Davies, was a keen enthusiast of Vincent motorbikes and his passion included restoring some of these classics, it is hardly surprising that his two interests came together in the names he chose for his new sleep diagnostic devices. Starting with the Grey Flash and moving on to the Black Series including the Black Shadow all can trace their names back to Vincent motorbikes. The Grey Flash was in production between 1949 and 1952 and it was capable of 115mph from a 500cc, 35bhp engine so was extremely fast and lightweight and was used in racing at Brands Hatch and The TT. Only 31 were made. The Black Shadow appeared in 1949 with a 998cc capacity. It included a new design of forks, the use of aluminium and a novel way of mounting the engine, all making it extremely quick. In 2005 it appeared as the 42p stamp in a range of British postage stamps celebrating the UK motorcycle industry- each motorcycle selected represented a significant technological step forward at the time: The Vincent Black Shadow being the fastest standard motorcycle.